FIBROID TREATMENT IS NOW A BREAKTHROUGH IN OUR CLINIC. In our clinic, we have the best herbal remedy for fibroid that eliminates them without need for surgery. Treatment duration depends with the size of the fibroid and duration one has lived with them. In most cases it takes 3 months. The major cause of fibroid is too much estrogen hormone being released by the body. This estrogen neutralizes the protein digestive enzymes which are supposed to digest excess animal protein. The undigested animal protein accumulates in uterus forming fibrous tissue which is now referred to us fibroid. Some people have low protein digesting enzymes being produced by the pancreas. If this is the case, we prescribe pancreas rejuvenating formula. How we treat Fibroid in our clinic. Fibroid is easy to treat. Animal protein diet restriction is the first step towards solving fibroid menace. The second step is herbal remedies to balance hormones and make sure excess estrogen hormone production is checked. The final stage is prescription of a herbal remedy that has been proven to digest and break down the fibrous tissue (made of protein) that forms the fibroid. In case a fibroid is very old, We have a special electronic massage that loosens and weakens down the tissue. If you have fibroid avoid meat immediately or all animal protein including white meat and other foods which you will be advised by our consultant. 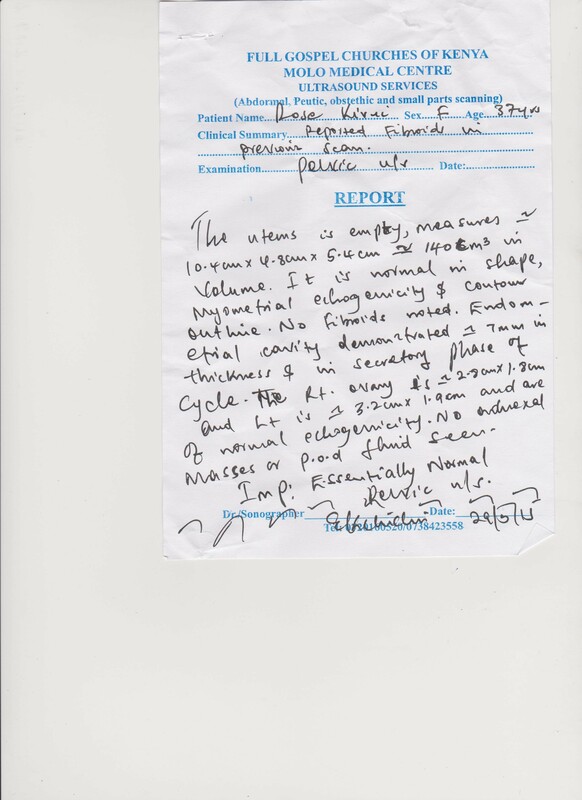 Testimony of successful fibroid treatment in our clinic. NB. We have obtained consent from the patient named to publish her medical report. 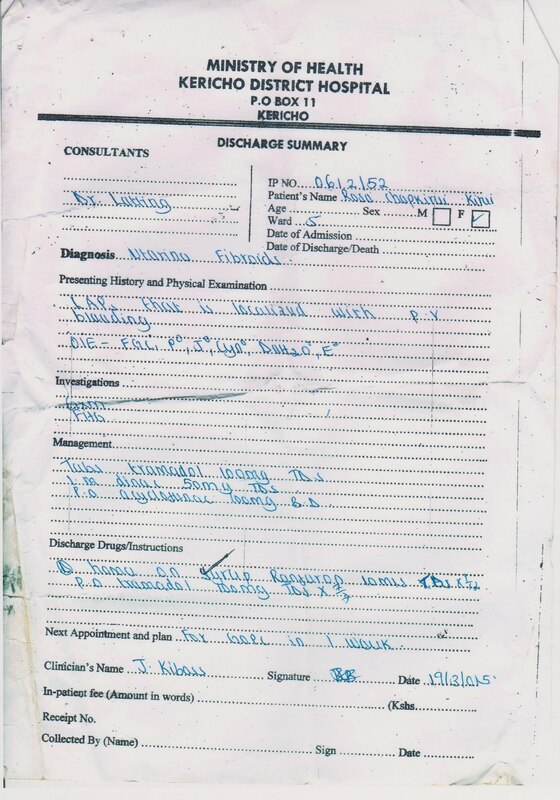 We do not publish patients medical reports without their permission. She decided to come to our clinic on 25th march 2015 after being referred by brother in law whom we had treated Asthma successfully. 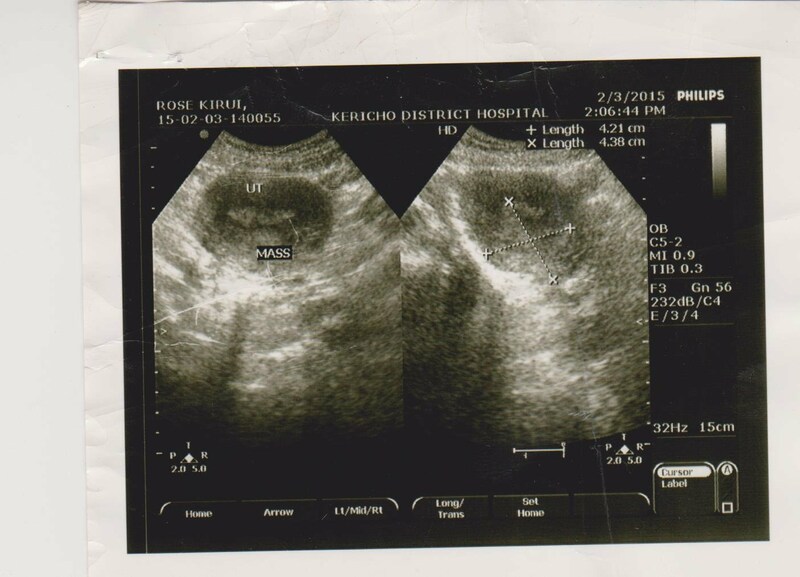 We gave her fibroid treatment and after 2 months on 29th may 2015 she did another pelvic scan which shows empty for Fibroids. Her complains were healed. 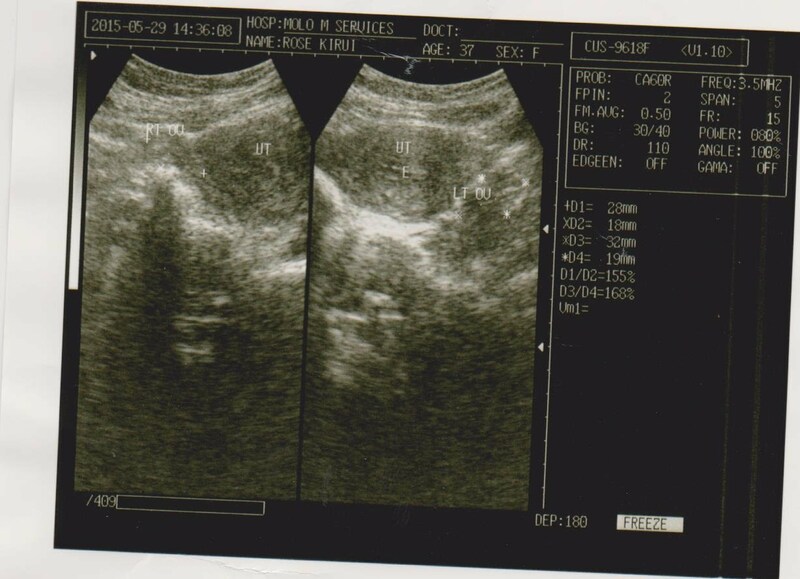 No fibroid, No severe pain and no bleeding. See attached scan and doctors report. Contact us via 0720760419 to book an appointment. There are currently 0 users and 793 guests online.